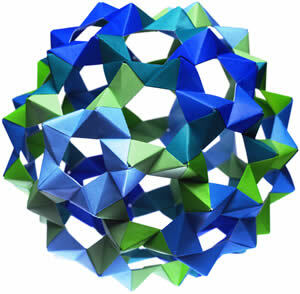 I found one of these modular origami spheres hanging in a restaurant and searched the web until I found it at Prof. Tom Hull's modular origami web page. He invented this modular origami system. After making a few dodecahedra I decided to make a 120 unit buckysphere, a Carbon-80 equivalent shape. Many days later I finished the object on the left and it became part of my husband's company's corporate identity. Later, Prof. Hull put up information on making modular origami tori (donuts). 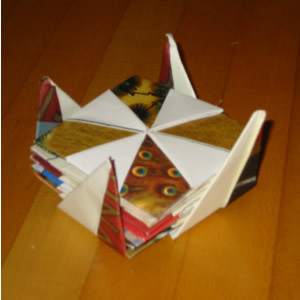 I used Sarah-Marie Belcastro's octagonal fundamental unit (5 of them). Furthermore, I decided that it would only read visually as a wreath if I used three colors of green and did a three-color edge partition. This means that each edge never touches another edge of the same color. Solving a three-color edge partition for anything larger than a dodecahedron is nontrivial, so I wrote a program in Java to calculate it (Java 2 plug-in required). Or you can just grab the color diagram here. And what's a wreath without holly berries. The berries are 2 in. red kami paper folded into waterbombs and sewn to the wreath. 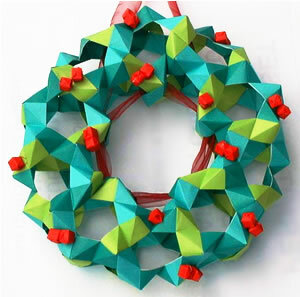 The wreath is made of 105 pieces of 4 3/4 in. kami paper in three shades of green. I hung the wreath by putting a ribbon through one of the outer rim holes, looping it around the interior of the wreath, and sending it out an adjacent hole. 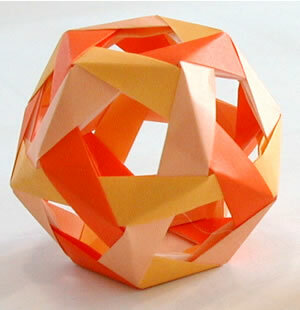 This was my first attempt at one of Tom Hull's modular origami, a dodecahedron. I used 6 inch paper and it came out huge. So I suspended a crane inside it and hung it in my son's bedroom. We call it a bird cage. 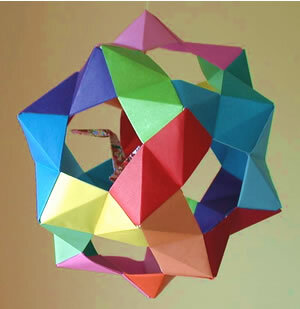 Of course there are other kinds of modular origami. This penultimate module can make many different shapes. Most of which don't need glue! This one also has a three-color edge partition (I'm a big fan of three-color edge partitions in case you didn't know). I really like Alex Bateman's Rota Coaster model. At the end of the year I like to cut up the pictures in my calendars and make coasters for my friends. But the wrap folds are very hard. After playing around for a while I discovered how to create the same coaster using simple folds only. Click here for the diagram.